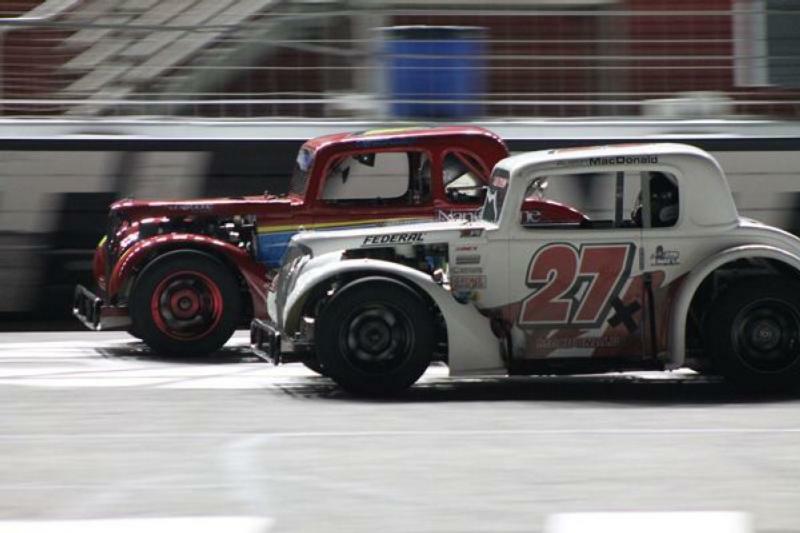 Three weeks of sensational short track action are in the books for Atlanta Motor Speedway's 2018 season of the Thursday Thunder Legends Series Presented by Papa John's Pizza. Fans have been treated to close racing and constant lead changes on the "Thunder Ring", leading to close points standings battles. Divisions that have consistently made headlines so far this season are the Masters, Associates Group Insurance Young Lions, and VP Racing Fuels Pro Divisions. Opening night in the Masters Division saw Robbie Woodall race side by side with Bill Plemons Jr. before securing his first victory of the season. Week two saw the reversal of the previous week, as Plemons Jr. slid past Woodall for the lead at the beginning of the event. Although Woodall tried to fight back, his car was not strong enough to get past Plemons Jr. Plemons Jr. pulled away from Woodall to secure his first win of the season. Week three provided the "rubber match". Plemons Jr. started out front and stayed there, as he fought off all opponents. As a wily Woodall gave Plemons Jr. some taps toward the end, Plemons Jr. picked up the intensity driving away from Woodall to collect his second straight win of the season. Plemons Jr. has secured his place at the top of the championship points standings, at least for now. The friendly, back-and-forth rivalry between Plemons Jr. and Woodall continues into week four. Will Woodall once again tie up the points? Or will Plemons Jr. continue his winning ways? The Associates Group Young Lions Division points race is led by Ryan Rackley, who is also the national Young Lions points leader, after winning the first two events of the season. Rackley faced challenges from Lawson Ingold and Austin MacDonald during week three action. Ingold, outrunning MacDonald for most of the night, made a mistake and spun out, opening the door for MacDonald to fight off a feisty Rackley for his first win ever. Can Rackley bounce back in week four to maintain his points lead, or will MacDonald make it two in a row? Meanwhile in the VP Racing Fuels Pro Division, Stockbridge's own Jensen Jorgensen positioned himself on the path to the division points championship, as he won the first feature race of the season. That is until week two. Dawson Fletcher, just 14 years old from Canton, burst onto the scene, driving to victory. The division drivers cranked up the heat as the first bonus points cash in occurred in week three. Fletcher once more returned to the "Thunder Ring" from his rookie pro late model season to capitalize on his success from the previous week. Running a limited schedule, Fletcher had a "go hard or go home" attitude. Fletcher chose to start from the rear of the field to try to collect precious bonus points toward his championship run. Fletcher fought his way to the front, passing leader Cody Hall with only two laps remaining, collecting his second victory and the bonus points for starting at the rear. "If we want to be in contention for points this is what we had to do, says Fletcher. "We had to start in the back and bring it to the front." The main storyline for this week - Will Fletcher make another appearance and continue his winning ways, or will a fellow competitor take away his hold on Victory Lane? The 2018 season continues with week four action this Thursday, June 21 for Scout Night at the Races. All scouts in uniform will receive a special discount on their tickets and will be eligible for scout themes giveaways all night long! The 2018 season will run each Thursday night through July 26, before wrapping up with a special-edition Saturday Championship Night on August 4.